Pretty renovated apartment located in a private area closed with a gate. 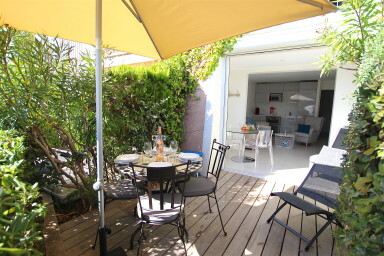 It is about 5-minute away from the beach and the city center. It has been entirely renovated in a modern style. The apartment is on the ground floor with a separate entrance and a terrace with a beautiful view on the canal. It is composed of a living-room with a sofa-bed, an very well furnished open kitchen, a bedroom with a double bed and a single bed above and a shower-room. On the canal side, a wooden terrace to relax while enjoying the sun. A numbered parking space on the opposite parking. A bright and comfortable apartment that will satisfy everyone!